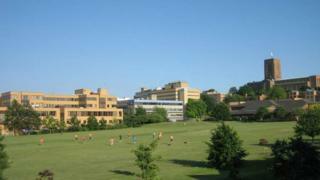 The University of Surrey has offered voluntary redundancy to all staff as it seeks to make £15m cuts. Vice chancellor Max Lu said universities faced "unprecedented pressures", including Brexit and a possible reduction in tuition fees. Staffing levels will be reduced and £5m could be saved by "not filling all our existing vacancies", he said. A spokesman refused to say how many jobs were at risk, but said compulsory redundancies could not be ruled out. Mr Lu said: "Some of the main financial challenges include reduced income due to Brexit and an ever more competitive student recruitment environment, significantly increasing pension costs and a national review of tuition fee levels." A government-commissioned review, led by Philip Augar, is expected to recommend a reduction in tuition fees to £7,500. Mr Lu added: "Our university also faces the not inconsiderable impact of a fall in our national league table positions." A spokesman said "the university sector as a whole is facing unprecedented challenges," adding: "These challenges mean that, without action, our expenditure is forecast to exceed our income." The spokesman said: "We are taking appropriate and considered actions across the university in order to balance income and expenditure, while continuing to achieve our strategic goals, and to prioritise our focus on providing the best possible teaching experience for our students."